Since the only ingredient needed to use a steam cleaner is water and heat, cleaning and sanitizing your home has never been more environmentally friendly. After all, does it really make sense to make a sandwich on a counter-top that’s been sprayed with poison? 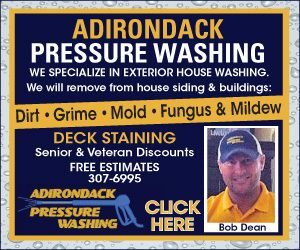 Not only do you eliminate chemical residues in your home, making it a safer place (especially for children and pets who practically live on the floor), but you also help the environment by reducing the amount of chemicals that get washed down the drain and recycled back into our water supply. 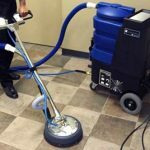 While you’ll still need to put in the effort, the results after using a steam cleaner surpass the conventional method of solvent and sponge. 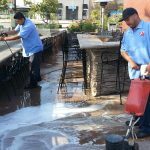 Since steam deodorizes and sanitizes with heat and moisture, debris is removed thoroughly and quickly, leaving a chemical-free clean and making your job easier. From bathrooms to basements, for large surface areas like tile floor and counter-tops, carpeting, upholstery and even barbecue grills, there are attachments for every area of your house. You’ll end up cleaning things you’ve avoided for ages. You will never have to decide on lemon or pine scent again! 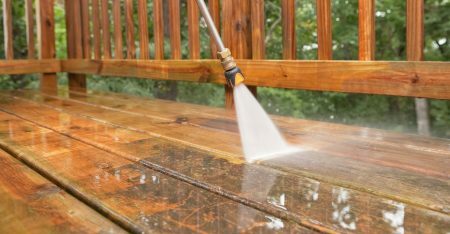 You’ll never need floor polisher, glass sparkler, oven cleaner, tile blaster, or the bald guy in the white t-shirt hanging around again (for those who didn’t get that reference – Mr. Clean). You won’t even need those sweaty rubber gloves to protect your hands from solvents. 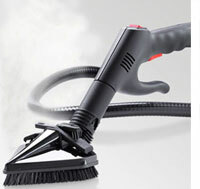 Owning a steam cleaner means owning one exceptional cleaning and sanitizing product for many of your cleaning needs. 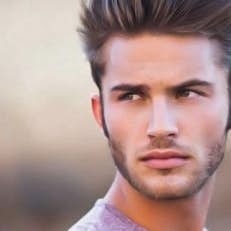 What will you do with all the extra money? What will you do with all that extra space? Bacteria, viruses, and mold may not be detectable, but they are potentially some of the most hazardous pathogens that can result in irritations, allergies, and infections. 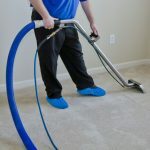 When a steam cleaner is used, the tiny hot vapor molecules penetrate the pores of a surface, and as they come in contact with the cool surface of the pores, they expand and force all dirt, debris, and bacteria to the surface. Vapor molecules are so hot that they are not only able to extract pathogens like E. Coli and Salmonella from surface pores, but also kill them. Good-bye infectious enemies! The sun pours in, and there are little “things” floating in the stream of light. 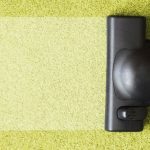 No, it isn’t mood lighting; many of these airborne particles are some of the most prolific allergy triggers in the home – the waste matter of dust mites, second only to pollen in causing allergic reactions. Using a steam cleaner regularly will remove these microscopic, sneeze-inducing pests for good. Some allergic reactions translate into asthma (which is on the rise among children), but studies show that avoiding allergens in early childhood can prevent the onset of asthma. 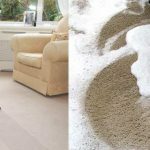 Friendswood Carpet Cleaning offers a great service for this type of cleaning. Using a steam cleaner is a great way to keep everyone in your home healthier by eliminating these allergens from your mattress, pillows and upholstered furniture. Steam cleaners can help transform a germ-ridden, odoriferous nursery into a sparkling clean, chemical-free baby sanctuary. Toys, especially those that are shared with other children, are notorious germ traps that are more than efficient at attracting a host of bodily fluids. A steam cleaner will kill any lingering guests after a play date filled with sneezes and runny noses. Just because you have a pet, your house doesn’t have to smell like one. 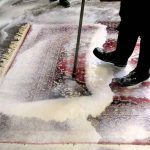 A steam cleaner will eliminate eau de dog, sanitize birdcages and aquariums, and spruce up the litter box area so you needn’t hold your breath as you walk past. The high-temperature heat kills fleas, their eggs, and their larva. Using a steam cleaner will eradicate these tenacious pests without the use of harsh chemicals. Dust mites, the irritating cousins of the tick and spider, feel quite at-home in your home, or more specifically, in your mattress, upholstery, rugs, carpets, quilts, pillows, and stuffed animals. In these soft, plush environments, dust mites feed on flakes of dead skin shed from humans and animals. These critters then leave behind their waste matter – a major allergen and asthma trigger. 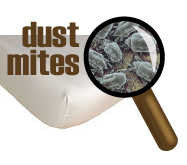 Here’s some simple math for you: a single dust mite deposits up to 20 droppings a day, and the average bed is infested with millions of dust mites. You’re in bed an average of eight hours per day, so you’re side by side with an enormous amount of debris that can make you feel as though you haven’t been in bed for eight hours. So what does this have to do with steam cleaning? Well, in the same way that steam kills fleas, steam will obliterate dust mite colonies in your mattresses and carpets. Regular steam cleaning followed by vacuuming with a HEPA vacuum to pick up the allergenic debris will make a significant difference in your home’s air quality and most importantly, your family’s health.